← Winter CSA Box 10 – Finally, some veggies! Sometimes, ideas on how to use my vegetables come from strange places. I receive a catalog for skin care products (huh?) 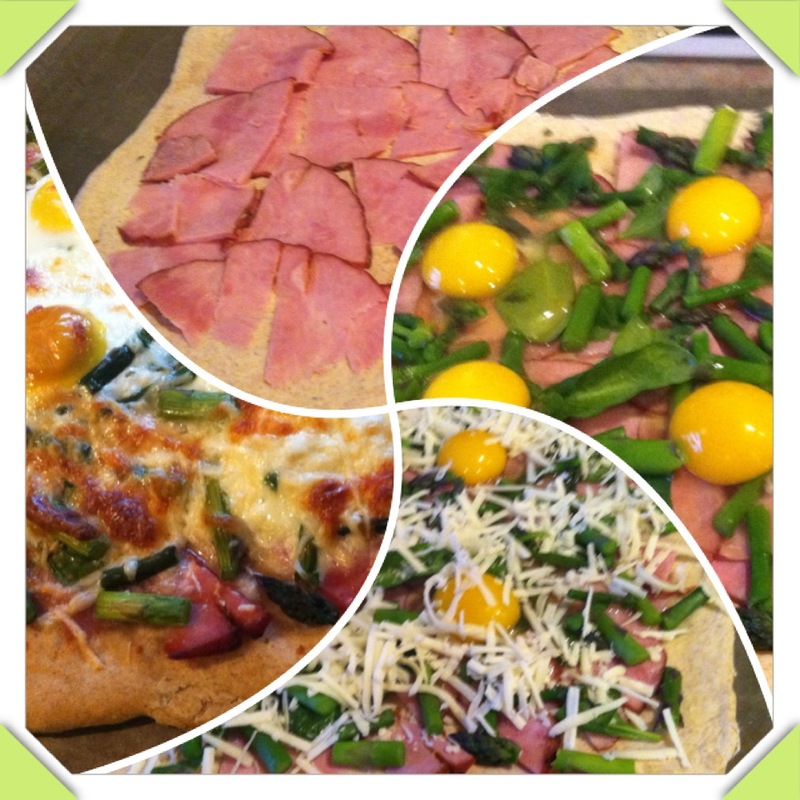 that has expanded to include a few food items, and it had this recipe for breakfast pizza that looked yummy. The kids will ALWAYS like pizza, right? Pizza for breakfast should secure me a spot in the Awesome Mom Hall of Fame, right? We had pizza for dinner yesterday, so I planned ahead and had extra pizza dough ready to roll (literally, ha ha!) this morning. I added extra veggies to up the nutrition factor and the numminess (as far as I am concerned) and used leftover ham from Easter that my husband had smoked. It was a Maple Bourbon Ham from Smoke & Spice that has an extraordinarily flavorful exterior. That ham recipe is a keeper for sure! Preheat the oven to 475°. Roll pizza dough into a 9″x13″ rectangle and place on pizza pan coated with olive oil or olive oil cooking spray. Cover the pizza with the ham, then add spread the spinach and asparagus over the pizza, leaving about a 1″ border of crust all around. Break the eggs onto the top of the pizza. The asparagus and spinach really did keep the egg whites from running off the pizza. Top with the cheese all over and bake for 15-20 minutes until the cheese is melted and golden brown. The four stages of breakfast pizza creation. The eggs set nicely and the final result was easy enough to assemble in the morning before school and work. My 15 year old son was too wigged out by eggs on pizza and refused to even try it. His loss, because this was WAY better than the honey nut cheerios he ate instead. However the rest of the family loved it. The twelve year old ate 3 pieces! This entry was posted in Recipes and tagged asiago cheese, Asparagus, breakfast pizza, cheese, eggs, ham, mozzarella, pizza, smoked ham, spicah. Bookmark the permalink. That is a very cool app, and, given the fact that your kid fixed himself a bowl of cereal instead of creating more work for you, I’d forgive him as well. I’ve only used picmonkey for collages (thanks to Heather from In Her Chucks for sharing that site) but your collage is very neat–I like it. Eggs on a pizza–inspired idea! I may have to run with it! Wow! Must try … love how you got the aspargus in there!!!!! Pizza for breakfast. Now there’s a concept I can sink my teeth into…literally. The collage was very cool.